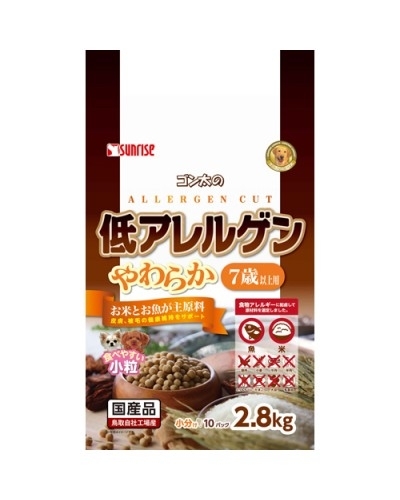 In order to avoid the allergy, low allergy arising fish and rice were used in present food. The soft-moist texture is suitable for the dos that cannot eat hard things. -In order to avoid the allergy, low allergy arising fish and rice were used in present food. -The soft-moist texture is suitable for the dos that cannot eat hard things. -Oligosaccharide was also added to keep a healthy stomach condition for your dogs. Cereal grains (rice, rice bran, barley, millet, Barnyard, acne), seafood (fish, fish collagen peptide), sugars, starch hydrolyzed protein, oligosaccharides, potatoes, quality maintenance agent (propylene glycol), thickening agent (glycerine), minerals (calcium phosphate, calcium carbonate, sodium chloride, magnesium sulfate, ferrous sulphate, zinc carbonate, copper sulfate, manganese carbonate, calcium iodate, potassium chloride), preservative (potassium sorbate), vitamins (A, D, E, B1, B2 The B6, B12, C, niacin, Pantothenic acid, folic acid, choline), amino acids (L-lysine hydrochloride), pH adjusting agent, antioxidant (sodium erythorbate, mixed cover rolls, Rosemary extract.